Naomi Klein was impressed by the force of the demand for repayment of an ecological debt when talking in June 2009 to Angelica Navarro, the young Bolivian ambassadress to the UN in Geneva. The book denounces the inaction of the United Nation during and after Copenhagen 2009, and the failure of world top politicians to face the issue. It narrates with good humor the author’s participation as an invited (or uninvited?) guest at the Heartland Institute gatherings of politically motivated climate change deniers, and also at a retreat of top experts on geoengineering methods including Ken Caldeira and David Keith sponsored by the Royal Society in Chicheley Hall, a splendid country house in Britain shared on the same days by the Audi motor company. The book explains her forays up to the barricades and blockades against open cast gold mining in Greece by the Canadian Eldorado company and against shale gas fracking in Romania by Chevron, against oil pipelines in Canada, into the marshes of Louisiana to inspect the damage from the BP spill. Drawing on EJOLT reports and other sources, she reconstructs the true story of the proposal to leave oil in the soil in Ogoniland in the Niger Delta and in the Amazon of Ecuador, and the founding of Oilwatch in 1995 which already combined local resistance to the fossil fuels industry with emphasis on the “unburnable fuels” that we should leave untouched if increased concentration of carbon dioxide in the atmosphere is to be avoided. The book includes travel to the Alberta oil sand devastation and participation in the “cowboy and Indian” resistance to the Keystone XL and other pipelines. The cowboys and the Indians were on the same side. It shows the success of resistance movements against fracking in France and elsewhere (they resist because of methane emissions, and local harm to water and landscapes), and also the resistance to mountaintop coal removal. Naomi Klein, no doubt, could have travelled even more, she could have visited other awful coal mines in India and China to reinforce her point on the potential convergence of local and global resistance to the fossil fuel industry. But she has travelled enough – and while writing this book she was also trying to have a baby, now a toddler, Toma. She went through a couple of miscarriages. She devotes some pages to these events so normal in women’s lives but also so very demanding. It is unusual that they would appear in a book on climate justice but she wants us (her thousands of readers) to know her better as a person, she wants us to understand the importance of social reproduction and care over economic production, and to show the power of regeneration of life as shown in her own intimate experience. She could have quoted Georges Bataille on the anti-entropic potentialities of life. She is not a doomsayer. Her labours, her written work and documentaries are not only for the social movements at present, they are also for our children and grandchildren, and for the benefit of life in the planet. She quotes article 71 of the Constitution of Ecuador on the Rights of Nature, including the obligation to respect and restore the regenerative powers of Nature. The “right to regenerate” is a keyword of this book which calls for a global climate justice movement, It does not give detailed instructions on how to get it going and how we should proceed. Should we go to Paris in 2015? There is no obvious need for this because many environmental movements of resistance already exist wherever we are living. However, perhaps some of us should also go to the streets of Paris, one million peaceful people and take over the COP? 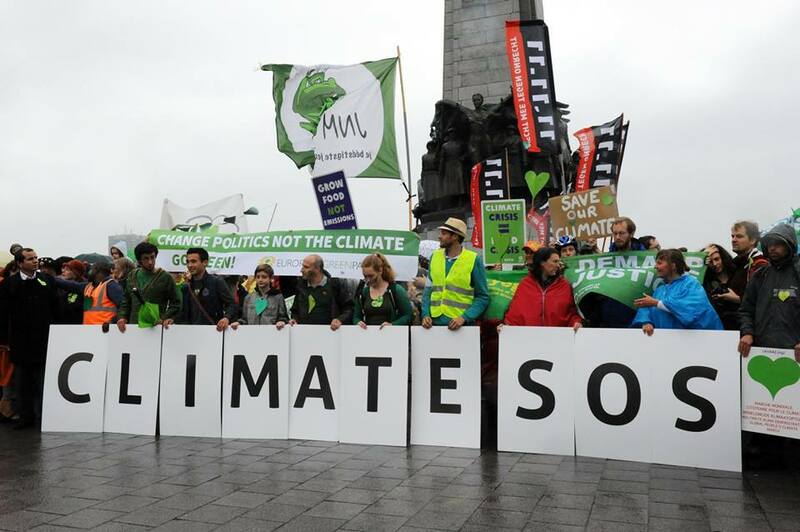 The movement against climate change must be open to other movements – for instance, the movement in the various countries for a universal citizens’ income that can put the whole socio-economic system in question. It must be a movement so vigorous and successful as anti-slavery was, and feminism has been, and even more. 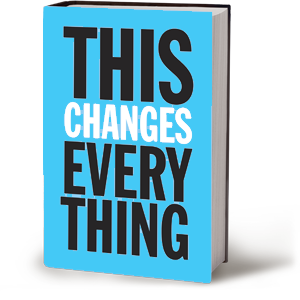 The movement must be aware of itself, placing climate change at the centre, “the thing that changes everything” as she came to realize after her two previous famous books No Logo and The Shock Doctrine. If we must still suffer the insufferable COP meetings, if the languages of climate debt and ecological debt (and now, perhaps, of enormous “loss and damage”) are not accepted by rich countries in the international official meetings, it is because the environmental movement became weak or was bought off. Naomi Klein holds that environmentalism in the 1960s and 1970s was stronger than later. In North America after Rachel Carson in 1962 it achieved some legislative and practical successes, listed in this book, being reinforced in the 1980s by the US Environmental Justice movement fighting against “environmental racism”. Its strength was lost in the neoliberal era of Ronald Reagan and later with Stephen Harper in Canada which is Naomi Klein’s own country. The self-regulating market became a triumphant political slogan, today weakened after the financial and economic crisis of 2008. Failed schemes for carbon credit markets were proposed in Europe. It is time for more radical policies. But they will not come from ineffectual politicians like Obama or from the UN. In December 2012, Brad Werner… made his way through the throng of 24,000 earth and space scientists at the Fall Meeting of the American Geophysical Union in San Francisco… Werner’s own session… was titled “Is the Earth F**ked?”… Standing in front of the conference room, the University of California, San Diego professor took the crowd through the advanced computer model he was using… He talked about system boundaries, perturbations, dissipation, attractors, bifurcations… in complex systems theory. But the bottom line was clear enough… When a journalist pressed Werner for a clear answer on the “Is the Earth F**ked” question, he set the jargon aside and replied, “More or less”. There was one dynamic in the model, however, that offered some hope. Werner described it as “resistance”… this includes “environmental direct action, resistance taken from outside the dominant culture, as in protests, blockades and sabotage by Indigenous peoples, workers, anarchists and other activist groups”. Such “friction” is needed to stop the economic machine that is careening out of control”. It was encouraging that this weekend saw the largest mobilisation on climate change in the history of mankind – with hundreds of thousands marching in 2700 different events in 156 countries. One of the marchers was a district Attorney from Bristol County, Massachusetts (US), who declined to prosecute Climate Activists who peacefully resisted to climate disruption by anchoring their boat at a place where a ship was planning to unload coal. That is the kind of action that gives hope: climate activists taking matters in their own hands and officials who dare to stick their neck out. It’s the activist blocking coal ports that are part of what Naomi calls “Blockadia” and that’s where our hope rests. As Walter Benjamin might have said, such movements of resistance must go beyond exercising a little “friction”; they must vigorously pull down the emergency brakes in the economic engine that is producing more and more greenhouse gases. The Anthropocene is the era in which humankind has become a geological force spoiling the face of the Earth but it could also be the era when humankind, through its local and global resistance movements, stops climate change and helps regenerate the diversity and richness of life on Earth. Climate change is real but the political class is going to make the poor and middle class foot the bill for it– while the 1% will get subsidies for buying new Teslas the 99% will have to make ends meet with their same old cars running on fuel that will be taxed into the stratosphere and they get blamed for the problem. New gas taxes will pay for costal mitigations that will primarily benefit the 1%, as Climate Change becomes a convenient distraction away from Citizen’s United fixes and financial reforms.